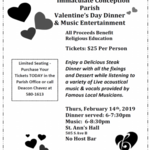 Enjoy a Delicious Steak Dinner with all the fixings and Dessert while listening to a variety of live acoustical music & vocals provided by famous local musicians. 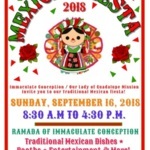 SEPTEMBER 16, 8:30 A.M TO 4:30 P.M.
Immaculate Conception and Our Lady of Guadalupe Mission invite you to our Traditional Mexican fiesta on Sunday, September 16, from 8:30 a.m. to 4:30 p.m. at the Parish ramada. It’s a Mexican holiday to celebrate Mexico's Independence from Spain on September 16, 1810. Traditional Mexican dishes will be sold. There will also be entertainment; crowning of the Queen of the Mexican Fiesta, competition of gastronomy, scenography, and traditional costume. The costume contest is open to the entire community. 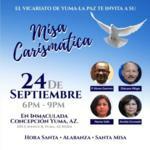 The groups of the Hispanic Apostolate have organized these events. 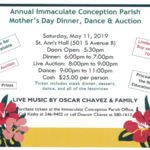 Presale tickets are available at the Parish office for $7.00 and $8.00 day of event. 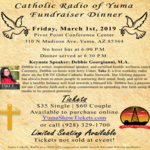 All funds raised will be used to help our Parish financial needs. 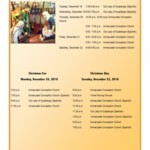 Thank you and many blessings from the Apostolic Hispanic Community.